I’ll admit that I’m not really the biggest fan of the long-running Terminator series. Despite that, I am a fan of the former governator Arnold Schwarzenegger in movies such as Predator and Total Recall. Terminator Genisys starts in the war between the humans and machines. Mankind is on the verge of winning until the machines send a terminator back in time to kill Sarah Connor, mother of the human leader John (Jason Clarke). The humans send their best, Kyle Reese (Jai Courtney), along with the terminator only for him to find he is not entering the plot of the first Terminator film, but a 1984 with a hardened warrior Sarah Connor (Emilia Clarke) and the Guardian (Arnie). I was a bit worried going into the movie having seen the Rotten Tomatoes score of 26% after I bought my ticket for an IMAX 3D showing. Fortunately, I was pleasantly surprised to see the movie wasn’t as bad as a 26% score would typically indicate. Overall, Terminator Genisys was a fun ride, if a bit incoherent and seemingly rushed. It’s unfortunate the trailer did a little too good a job spelling out what to expect in the movie. For the most part, the action was a lot of fun. 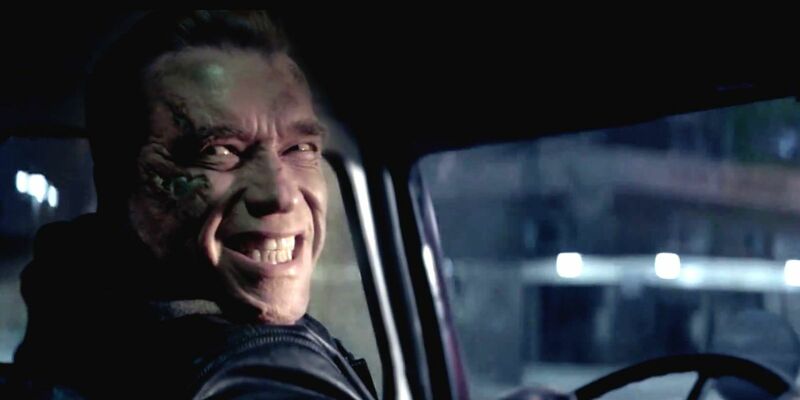 For me, the movie’s highlight was unfortunately one of the first things to happen, and that is Guardian (the real Arnie as he is in 2015) fighting a lifelike CG replica of Arnold as he was in 1984 in the first Terminator. Unfortunately, the movie also had some lousy scenes like a helicopter chase scene toward the end. It may be because I’m a mechanical engineer, but I simply didn’t buy the physics of the helicopters’ flight. To me, the movie was largely fan service without having some of the things that made James Cameron’s movies memorable. One such example of this was the new shapeshifter (Byung-Hun Lee). Despite being a completely different ethnicity, Lee proved that he was an extremely worthy successor to Robert Patrick, who played the shapeshifter in Terminator 2 back in 1991. The LAPD disguise was also a nice touch. I remember the inter-Terminator fights in Terminator 2 generally being better choreographed for me to believe that Arnold Schwarzenegger and Robert Patrick were two robots fighting each other. I also liked the horror aspect that came with humans fighting seemingly invincible machines in the earlier films. It’s one rare instance I will compare one director’s style to James Cameron’s in favor of the latter. For the most part, the cast did the best they could, but Jai Courtney and Emilia Clarke simply are not going to ever replace the well-established characters played by Michael Biehn and Linda Hamilton (even if they were already recast in The Sarah Connor Chronicles). It would also help if JK Simmons were in more of the movie. Despite that, even in his advanced age, Arnold Schwarzenegger demonstrates himself the the necessary ingredient for a Terminator movie. The lack of Arnie was one of many things that led to the poor reception of Terminator Salvation. Overall, the movie was an enjoyable way to kill an afternoon. I would recommend seeing this movie at a matinee showing. The 3D was quite poorly done.